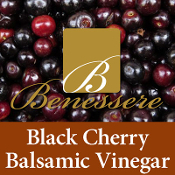 Rich and sweet natural black cherry concentrate and all natural flavorings are combined with aged balsamic vinegar. Copyright © 2010-2019 Benessere Olive Oils and Vinegars, Inc. All rights reserved. Downtown: Open Every Day 11:00am-6:30pm.